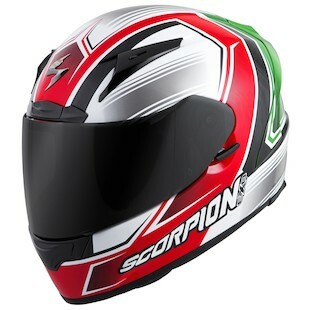 The EXO-R2000 is the top of the line race helmet in Scorpion's helmet offerings. The helmet developed on the track so this bad boy is all about the performance. This SNELL and DOT rated helmet uses Scorpion's special TCT Composite shell, providing a lightweight yet strong helmet. 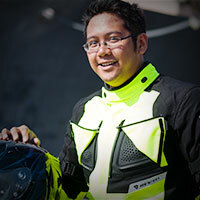 The tear-drop shape helps to stabilize the helmet at high speeds. The AirFit cheekpad system fills up air bladders to make sure the helmet fits snug. Think of it as Reebok Pumps for your head. This helmet is all focused on functionality and the new Scorpion EXO-R200 Fortis and Launch graphics will set you apart from other riders. Fortis is Latin and it means brave, strong, powerful, and courageous. This aggressive graphics exudes all those qualities with the Black/Red/White colorway. The Scorpion logo logo on the forehead area is showcased like a super hero logo in a black circle. Since most superheroes are brave and strong, I would say that this is right in line with the Fortis name. Feel free to fight crime in this. The new Scorpion EXO-R2000 Launch Helmet looks fast even when sitting on the table. The Launch graphic looks at home on a motorcycle or getting shot out of a cannon. However you want to spend your weekends is up to you. The sharp lines and White/Red/Black colors will look good flashing by on a motorcycle or flying through the air. The EXO-R2000 was developed with MotoGP riders on the track. 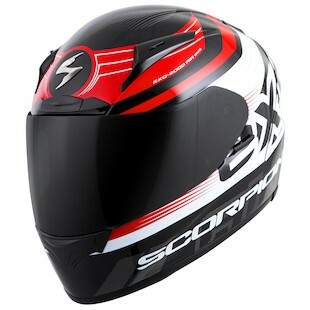 This top of the line helmet from Scorpion provides a unique composite shell that provides lightweight protection for those that need a high performance helmet, and thus, the speedy-inspired Launch graphic fits right in. A top end helmet needs top end graphics and the new Fortis and Launch graphics provide the looks that match up to the helmet. The Fortis and Launch graphics are anything but subtle and they will be provide unique styling on the track and the street.